Many restaurants have skillet options that often consist of 50% potatoes or eggs. Don’t get me wrong, these are delicious, but you can get that great skillet flavor on so much more. Take this dish for example, there’s nothing in here that isn’t good for you, and the vibrant flavors all come together brilliantly when cooked together in the skillet. This could easily pass as a meal for breakfast but is hearty and filling enough to work for lunch or even dinner. The garbanzo beans are filling and will please those tummies that feel a need to have meat or tofu with every meal (my husband is one of those, but he said that after this dish he was complete satisfied). I love how the kale and other ingredients got more crispy, yet there were delicious juices in the skillet packing in taste from the onions and tomatoes. The crunch from the pumpkin seeds is a nice touch and gives it some crunch which is always appreciated in my home. After tasting this you’ll be patting yourself on the back. The ingredients are energizing and satisfying, yet extremely healthy. I hadn’t mixed corn and garbanzo beans together but they work extremely well together, and I’ll be looking to marry the two flavors a lot more going forward. I purchased the cast iron skillet from Amazon. It’s made in USA and so affordable. Cook in the oven for about 15 - 20 minutes. Add salt if needed then add Fresh Kale. Cook for another 2 minutes. What a gorgeous recipe and photo! it makes me want to come right through the screen and try it! I love the combination of kale and garbanzo beans! I have now bookmarked your recipe! Thank you! easy recipe and very healthy. Hope you’ll like it! This looks amazing! I’m trying to eat healthier and one of my goals is adding more kale to my diet. I’ll be trying this recipe very, very soon! That really looks healthy and tasty! I am not sure if my kids would eat it, but I would like to try it. This is such a great recipe. It’s a full meal right there. I think my family will love this. What a delicious looking recipe. I don’t normally eat meatless meals, but I’m definitely interested in giving this one a try. Beautiful looking recipe! What is the benefit to baking as opposed to cooking on the stovetop? I love any recipe with kale. This looks delicious, and I love skillet meals because they are so convenient. I love any recipe with garbanzos! Kale seems to be everywhere lately, must try this dish out soon. I love anything with Kale in it! I will be honest never had garbanzo beans before but I am willin to try it with this recipe! I have only had kale in salads, but never cooked. This looks like a delicious recipe. This skillet sounds amazing. I love anything with beans in it and everything I can cook in a skillet! This recipe looks and sounds delicious! I wonder if I can pass this off to my family. OMG – I can hardly wait to try this. I’m always on the hunt for new vegetarian dishes and I love that it’s made in a cast iron skillet. Your photos are beautiful! This is an awesome recipe! I’m just starting to use kale in my cooking and I love it. This would make and awesome vegetarian dinner for my daughter and I.
I love a good “stir fry” and this one looks really good and clean. I am all about clean eating these days! This is my kind of meal! 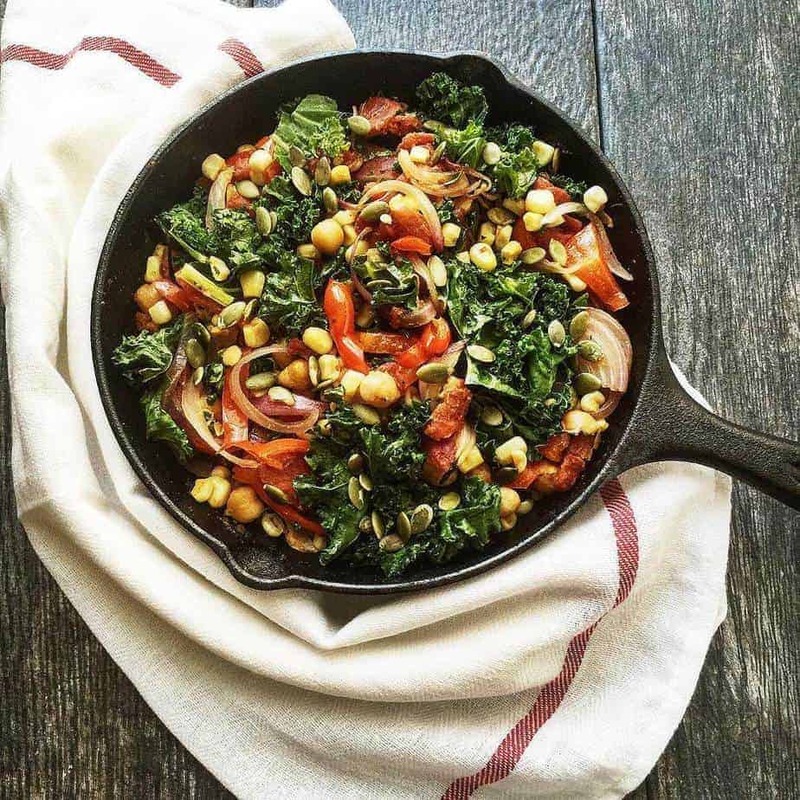 Often times when I need to whip up something quick I resort to sauteed kale…and love adding fresh tomatoes and some type of bean! Yum! That’s a great hearty meal to share with the family. I love the greens for fiber content. This dish looks good. I need to try making the roasted corn salsa. This would be perfect to pair on taco night. I need a good cast iron skillet. Yum, yum! I love kale and this looks super delicious. It would be perfect for a small bowl of rice, yum! I just love kale. Thinking about it is making me hungry. I haven’t tried it with garbanzo beans though. Bet that is delish! That looks delicious. I love kale and I also love garbanzo beans, putting them together is a perfect idea. Oh my veggie loving heart is singing right now! I totally need to make this this week! Wow that looks amazing. Would love to try this somtime, I bet my kids would even love it too they love beans and everything if Kale is involved! Ooooo now this sounds all sorts of deliciousness!!! I’m always looking for new male recipes. Totally going to have to try this out! That looks so delicious! I love kale and I’m always looking for new ways to include it in my meals. Will give this a try! This looks so delicious. I will have to try this recipe this weekend. I am sure it will be a big hit. I just love garbanzo beans. I grew up in Trinidad and we called them Channa over there. They are great in all kinds of curries and a great snack when fried and sprinkled with salt. This looks yummy. I like anything with kale in it. I actually haven’t tried kale before but this might just make me want to try it! Thanks so much for the recipe. Wow, you knocked this one out of the park. I’m not usually big on vegetarian dishes, but this one is a must try. I love anything that you can cook in a skillet ! It looks absolutely awesome! I as well conceive so, perfectly pent post! This paraagraph is actually a plerasant one it assists new net users, who are wishing for blogging.